In fact, you now can. Not only that, you can have it built to Passivhaus, or Passive House standard of insulation and air quality. 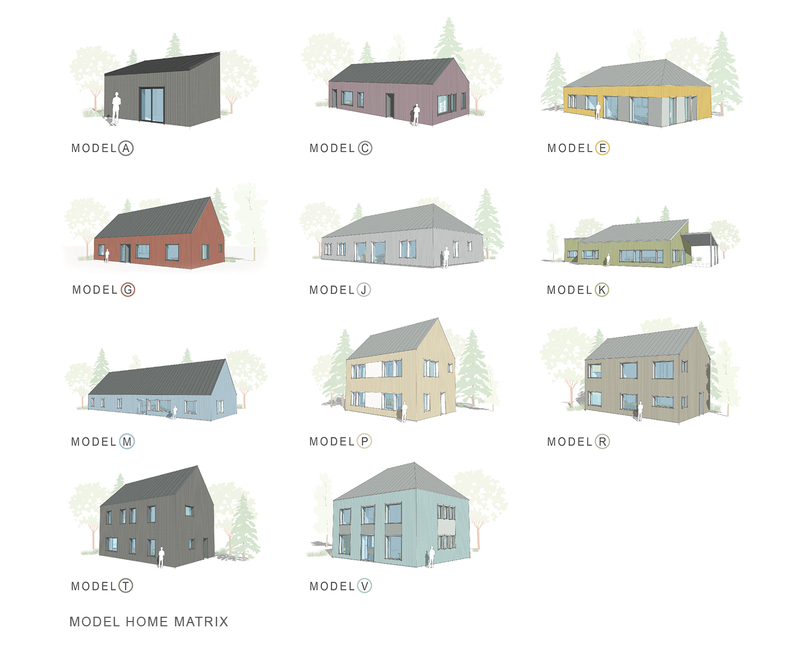 (Don’t know Passivhaus? See related links at bottom) That’s because Maine builder ECOCOR is importing the fancy RANDEK tools that slice and dice wood with such accuracy and assemble such perfect wall panels. You also get good design; they have teamed up with architect Richard Pedranti, who has done a few Passivhaus projects. 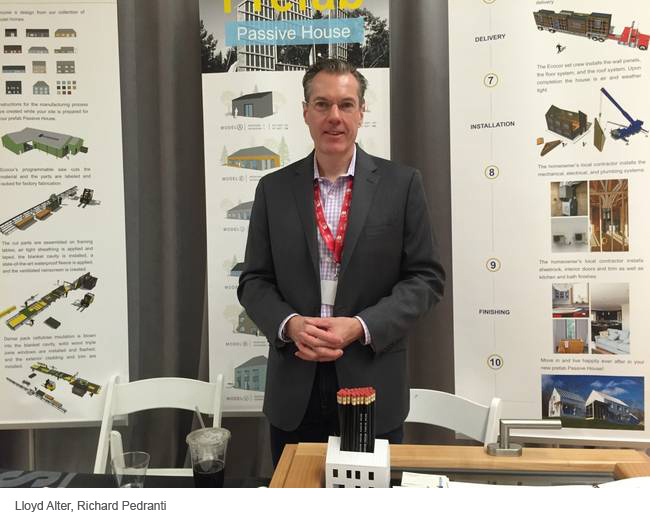 They exhibited at the North American Passive House Network conference and showed off a few pieces of wall. ECOCOR delivers panellized prefab rather than modular, requiring a bit of explanation. Modular construction delivers big boxes to the site, as big as are allowed down the roads. It means that you are shipping a lot of air, and need special permits, and even sometimes trucks in front and behind to warn other drivers. It’s expensive to ship. On the other hand, the boxes have all the plumbing, wiring and interior finishes applied in the factory, and they go together much more quickly on site. In panellized prefab, the floor and wall panels are built in the factory and shipped flatpack, getting much more floor area on a truck. They don’t need special permits because they don’t have to be extra wide. There is more flexibility in the design because it is not limited to box dimensions. On the other hand, it needs a lot more site work, doing the drywall, taping and sanding on site. If you are sending out a crew from the home factory to do it, they can be camping out for quite a while. In years past I have been a fan of modular over panelized. If you weren’t doing all of the wiring and finishing in the factory, what was the point? Framing is fast and relatively straightforward, so what’s the real benefit of panelization? But when you get into serious walls like you get in Passivhaus or the high efficiency walls of companies like Unity Homes, the story changes. 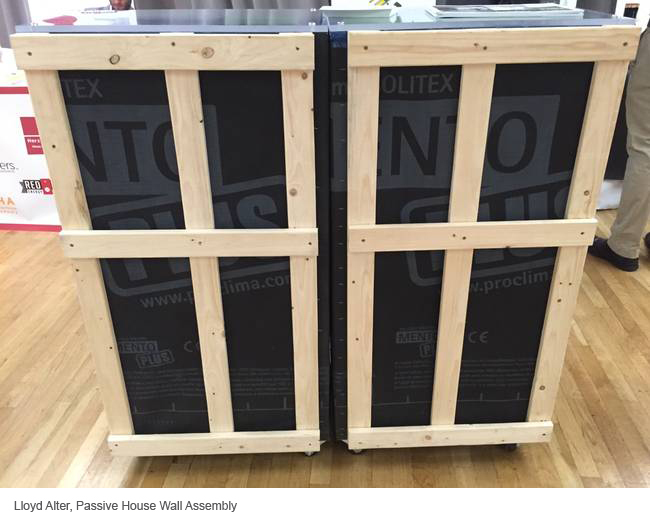 Walls are no longer just a row of 2×6 studs but complex assemblies controlling heat loss and moisture movement. Every connection and every detail matters. The precision that comes from sending an instruction from the architects’ computer to the CNC saw so that every stick of wood is precisely cut and placed starts to really matter. The careful placement of insulation is much easier to control in the factory environment with the wall on its side instead of vertical. 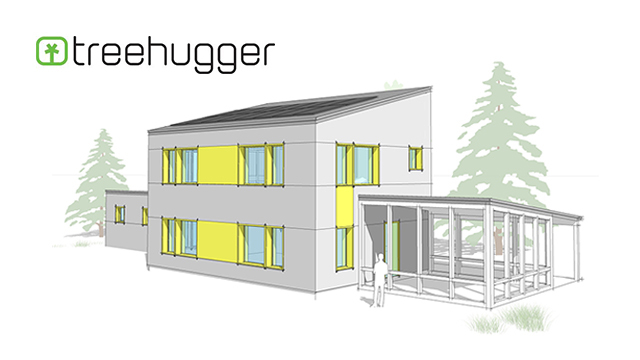 For Passivhaus, precision and accuracy matters, to ensure that the built product meets the design criteria. Suddenly panelization makes a great deal of sense: you are building a precision product and you don’t do that in the middle of a field. The wall has everything; a big space for electrical wiring on site, piles of cellulose insulation, MENTO moisture control membrane and then a substantial rain screen space. At the end of each panel there is a special layer of cellulose that squeezes together to the next panel, making the seal very tight. Richard Pedranti has done a range of interesting designs of different areas and forms, and they are mostly what California Passive House expert Bronwyn Barry called #BBB or Boxy But Beautiful- Passive houses tend to have simple forms because every bend or jog or pop-out is a potential thermal bridge. However jogs and pop-outs are the mediocre architect’s best friend; if it doesn’t look good, they just add another gable. It is hard to make something look really good when all you have is proportion and detail. Pedranti and I had a long discussion about how few of his designs had roof overhangs; I discussed this in my earlier post All about Eaves, why traditional architecture had roof overhangs. He made the persuasive case that we now know how to build walls that can deal with moisture so that we don’t have to have big overhangs to keep the water off the walls. ECOCOR is offering these homes on raft foundations, where the slab is poured on top of a massive raft of rigid insulation. This eliminates the need for frost walls, which cause major thermal bridging problems. They assume that there is almost no heat radiating from the home into the ground because of the amount of insulation, so that there will be no freeze-thaw cycle that would cause heaving under the foundation. And if it works in Maine, it will work anywhere. 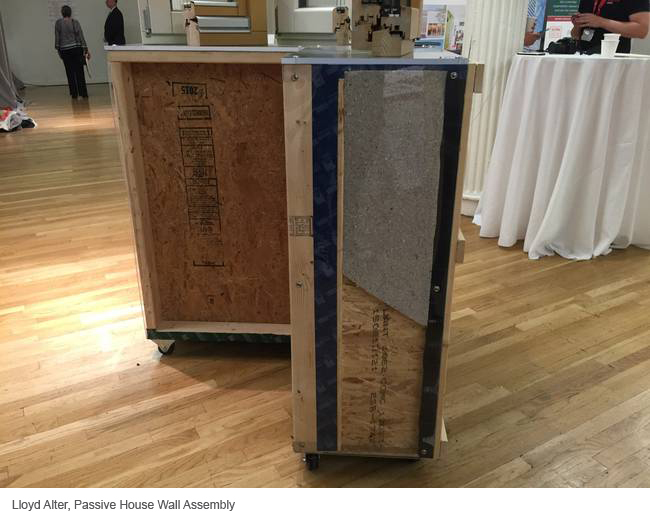 “Passive House” is today’s most energy efficient building standard. Buildings that meet the Passive House standard use 80% less energy for heating and cooling than conventional buildings yet are markedly more comfortable and healthy than traditional buildings. A Passive House conserves energy by creating a virtually air-tight, super insulated, compact building enclosure that uses the sun and heat emanating from people and equipment to achieve a comfortable indoor environment. A ventilation system including what is called a heat recovery ventilator or HRV is used to provide a continuous supply of filtered fresh air. Added all together, Passive House offers a triple bottom line: (1) personal health and comfort, (2) energy efficiency, and (3) affordability. 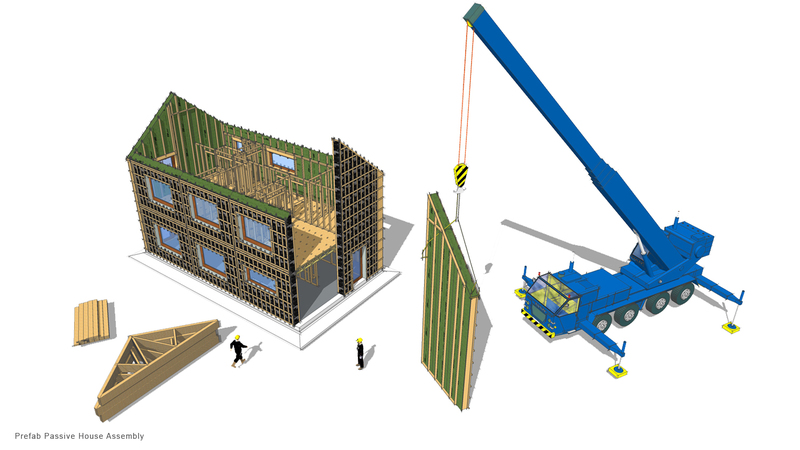 On their prefab process page, Ecocor shows how it works, from design to installation in “10 simple steps.” But it really is not so simple; you need well thought out designs and some fancy tools. This is sophisticated stuff of the kind we rarely see in North America. It’s about time. 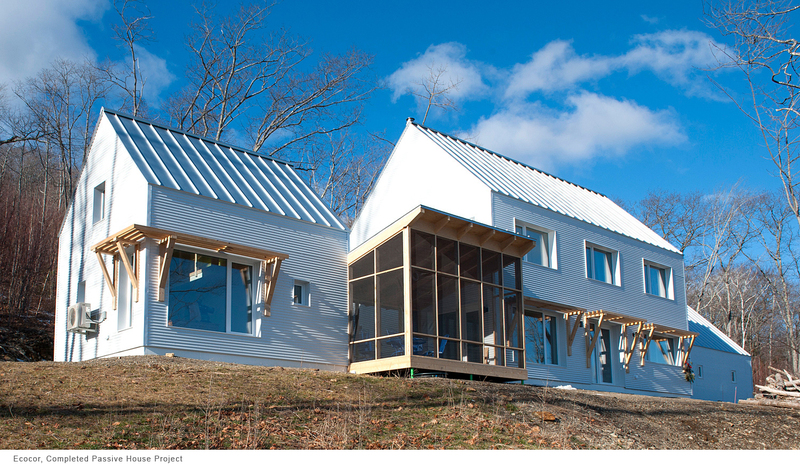 See this article on www.treehugger.com/green-architecture/ecocor-brings-swedish-building-tech-usa-produce-passivhaus-prefabs.html.